Lunars are sly, savage shape-shifters who dwell in the wilds, hunting their prey during the darkest part of night. Their prey may take the form of a wild animal, or it may take the form of a rube for a con or a particularly rich vault fit for thieving - lunars value treachery, cleverness, and stealth, and appreciate a good heist. Lunars keep their own council, dwelling in family groups and defending their chosen hunting grounds against those who are not members of the family. They don't believe the laws or strictures of others have any claim on them, and they treat other beings as targets and sources of wealth to loot. Lunars live outside the bounds of society, making their own structures and feeding themselves quite ably. Lunars respect skill and cleverness, and tend to scoff at other sources of authority. 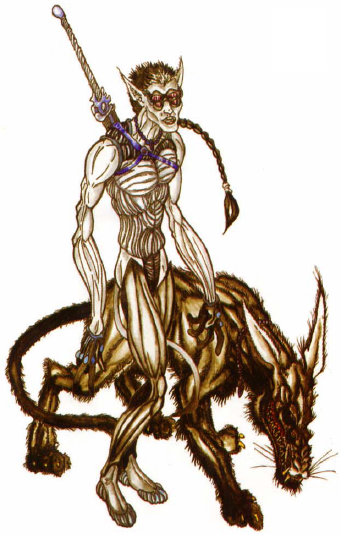 A lunar's humanoid form (dubbed their "social" form) is a slender, pale individual with four pale yellow eyes and a snaky, prehensile tail that can be used to hang from ledges and rafters or grasp items (though not use weapons). Their elbows and knees are double-jointed, and their face contains a slight lupine cast, with sharp, pointed teeth and long, feral ears. When hunting or fighting, a lunar typically transforms into their bestial form (dubbed their "wild" form), which is as large as a wolf, though certainly not a canine. Their creature resembles something like a cross between a wolf and a rat or a opossum, retaining the long ears, prehensile tail, four eyes, double-jointed limbs, and sharp teeth, but elongating the face to a muzzle, covering the body in black fur, and giving the lunar clawed paws in place of hands. A lunar prefers their wild form to their social form when fighting, and so typically eschews normal weapons and armor in favor of their bestial shape. Lunars value trickery, deceit, and evasion. Their heroes are those who pull great cons or steal great wealth, and their leaders are those who promote this insular, anarchic world. Lunars are also creatures intimate with darkness — they prefer total darkness at all times, and don't do well in bright light. Adult lunars have a single name chosen for themselves that is simple, rough, and strong. Lunars also name their homesteads and buildings, and they use this to identify themselves further if necessary. You have the following traits as a lunar. Age. Lunars come of age at about 20, and can live to be 110. Alignment. Lunars tend to be chaotic neutral in outlook. They are anarchic and freedom-loving, and they have no particular moral qualms about killing those that stick their nose in where it doesn't belong. Size. Lunars are about 6 ft. tall, and lanky, at 170 lbs. You are considered size Medium. Speed. Your walking speed is 30 ft. In your wild form, your walking form is 40 ft.
Darkvision. Your four yellow eyes are made to see in the dark. You can see in dim light within 120 ft. of you as if it were bright light, and in darkness as if it were dim light. You can't discern color in darkness, only shades of gray. Wild Form. While in wild form, you gain a bite attack that you are proficient with (it deals 1d6 piercing damage), your speed increases (as noted above), you gain advantage on Wisdom (Perception) checks that have to do with scent, and you cannot use items that require hands. You can adopt or abandon your wild form as a bonus action on your turn, and when you do, equipment you carry melds with the form and becomes non-functional. If you have spellcasting ability, you can still use that when you are in wild form. Light Sensitivity. You have disadvantage on attack rolls in bright light.